A monument commemorates Charles Sturt`s exploration of the Murray River in 1830. Captain Charles Napier Sturt (1795 – 1869) was a British explorer of Australia, and part of the European exploration of Australia. He led several expeditions into the interior of the continent, starting from both Sydney and later from Adelaide. His expeditions traced several of the westward-flowing rivers, establishing that they all merged into the Murray River. He was searching to determine if there was an "inland sea". 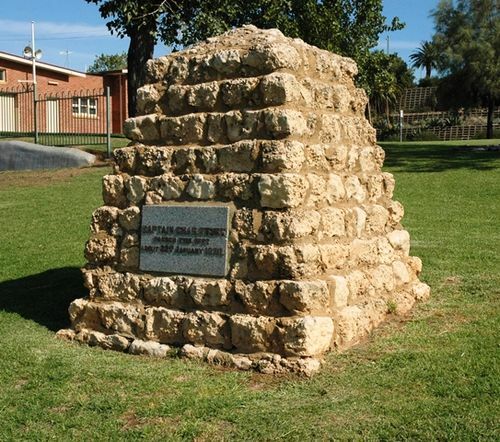 In perfect weather a large gathering attended the unveiling of a memorial cairn to Captain Charles Sturt at Mildura. The cairn is of concrete and limestone, and bears a plate with the inscription : "Captain Charles Sturt passed this spot about 22nd January, 1830." The site chosen is on a lawn near the rowing club shed, facing the river, and near the weir. The official party was headed by Sir James Barrett, chairman of the Victorian Historical Memorials Committee, and included members of the committee. Mr. E. T Henderson, the acting mayor, presided, and welcomed the visitors. Addresses extolling Sturt 's voyages; were delivered by Messrs. Henderson, C. E. Long and Sir James Barrett. Albury Banner and Wodonga Express (NSW), 17 January 1930.